How Big Will Your Koi Fish Grow? Home > Blog > Aquatic Animals > How Big Will Your Koi Fish Grow? Koi fish are one of the largest species in the world that is kept in ponds. 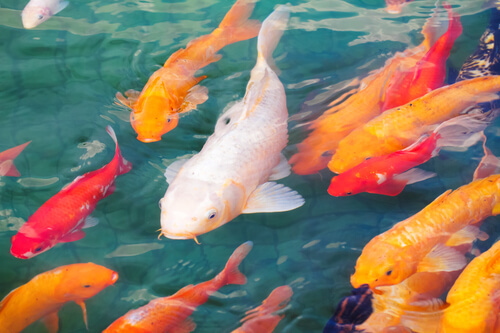 In an environment that is correctly maintained, such as a large aquatic space with conditions that are completely pristine and a temperature of about seventy five degrees, it is possible for a single koi to reach three feet in length with a weight of 12 pounds. By comparison, the average size for koi is about 2.5 inches in length with a weight of 1.5 ounces. The likelihood of your koi reaching the maximum size possible for this species is very small. However, if you’re like many pond owners and have the space you will want it to become as large as possible. Koi will continue growing for the duration of their lives, and some will grow more rapidly than others. The size and speed with which koi grow are influenced by many different factors, such as water temperature, genetics, feeding, water quality and age. Seventy five degrees Fahrenheit is the best temperature because koi will maintain a growth rate which is ideal. Both their body and muscle mass will increase quickly. Temperatures lower than seventy five degrees or which fluctuate regularly will result in a slower rate of growth and metabolism. Those who keep koi in ponds in the northern hemisphere should expect slower growth during winter. The quality of the water is also extremely important. Water which is clean and regularly pumped with oxygen will promote healthy koi, and while they can live in water which is cloudy or dirty, it will adversely impact their growth and vitality. Pond and aquarium owners are highly recommended to make use of aeration kits and healthy bacteria to ensure the water remains crystal clean. The diet that a koi maintains will play a pivotal role in its size and growth rate. Fish food that is rich in vitamins and or proteins is designed to maximize their growth, and some brands consist of ingredients which are used to enhance the fish’s color. The genes of koi will also determine their size. Parents who are gigantic will often produce offspring which is the same. When good genes are combined with water which is spacious and aerated and nutritious food, the outcome will often be fantastic! The final factor which will influence the size of koi is their age. As with most living organisms, koi will grow most rapidly while they’re young, and then their growth rate will decline as they become older. Koi will often double their size during adolescence, and as they age their rate of growth will slow. What all this means is that with the exception of genetics and age, pond owners have tremendous control over how large their koi get. A good environment and good food are the primary keys to helping your koi reach their maximum potential and beauty.